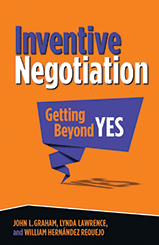 Inventive Negotiation is full of memorable stories that demonstrate deep understandings of both the opportunities and difficulties of diversity in international commerce. The authors deliver fresh ideas for building the key personal relationships that are driving innovation in the new global economy. In an era when cities are fighting desperately to attract and keep major employers, the recent negotiation between Amazon and the city of Seattle is unique. It’s a very sweet deal for the city: the new headquarters will house about 12,000 of Amazon’s 30,000 Seattle employees. That’s roughly the size of the entire cities of Annapolis or Helena or Juneau. If you figure that at least half of these employees have spouses, significant others, or kids, that means enough highly paid taxpayers to fill the whole city of Olympia. Amazon’s new headquarters are located in a formerly low-rise, low-rent warehouse district, “South Lake Union was a place that people drove through, not to,” according to Amazon’s John Schoettler, director of global real estate and facilities. And Amazon is paying for a bike lane and a new streetcar for Seattle’s light rail line, because the company encourages its employees to live near work and take alternative transportation. This philosophy has prompted apartment developers to flock to the area—last year Seattle issued more residential building permits than at any other time in the past three decades. Other technology companies are seeking space nearby. Northeastern University set up a campus across the street, and dozens of food trucks are already tapping the demand that will lead to restaurants and service businesses. And what did they get in return? Huge multiyear tax breaks, the primary demand of any large employer anywhere? Amazon didn’t even ask for them. The secret is that Amazon had the same vision and goals as the city. Amazon attracts smart, highly educated engineers and managers, often young—the very people who want to live and work in a vibrant, urban setting. Thus, setting up shop in Seattle is a recruiting and retention tool for the company. The city couldn’t have had a better negotiating partner if they had selected the team themselves. Even when tensions are high and the situation is life-threatening, it is possible to shift roles to produce an inventive negotiation. It was in the early weeks of the war in Iraq, and Iraqis of every faction were hostile to the American troops. Without any government of their own, the Iraqis’ sectarian rivalries were surfacing after decades of resentment. Religious leaders were being killed, mosques were blown up, civilians were at risk every time they left their homes, and often even when they didn’t. Without much knowledge of the culture, the American military was trying to slow down the violence and sent troops to guard religious leaders. The presence of heavily armed troops, however, served only to enflame the locals, who took to the streets with their own weapons. Every encounter was a firefight waiting to happen. A small contingent of American soldiers stepped out of armored vehicles at the opening of a cul-de-sac where a major religious leader was inside his mosque. Sent to protect him, the soldiers had only a single translator. As they gathered at the street corner, a few passersby quickly gathered and swelled to a crowd. The translator tried to explain that the soldiers were there to protect their leader, but the crowd couldn’t hear him or didn’t believe him. The people formed a solid, shouting, armed blockade, their weapons trained on the soldiers. One wrong move and hundreds would die. The young colonel could not perform his mission, and the situation was rapidly deteriorating. Then he did something creative—a move that went against every bit of training he’d ever had and that astonished his troops. He ordered them to lower their weapons, kneel in the street, and smile. Thoroughly trained in field combat but also trained to implicitly follow their leader, they complied. The fear still showed on the nineteen-year-old soldiers’ faces, but as they knelt, one by one, with their weapons lowered, pointing to the ground, the crowd grew silent. Why would hostile foreign soldiers be kneeling? The colonel then held his rifle high in the air, holding it by the barrel. Another sign of friendship. As the Iraqis grew quiet, the voice of the translator could be heard. Now the people in the crowd listened and noticeably calmed down. This gave the colonel an opportunity to withdraw his men with no blood shed on either side. By changing roles, from armed invaders to humble fellow humans, the soldiers transformed a potentially deadly encounter into one of peace. Other women Senators stood behind her. Indeed, most of the 20 women in the Senate had met informally the night before over pizza, salad, and wine in the Senate offices, and they had discussed several ways to compromise. None of the old cigars and poker chips there. No bluster or bluffing, just respectful positive discourse. Ultimately, Senate leaders Harry Reid and Mitch McConnell were shamed into better behavior, and that different sort of discourse among the women had led directly to more inventive options. From the time they are boys, males play more violently than females, fantasize more about violence, consume more violent entertainment, commit the lion’s share of violent crimes, take more delight in punishment and revenge, take more foolish risks in aggressive tactics, vote for more warlike policies and leaders, and plan and carry out almost all the wars and genocides. . . . Historically, women have taken the leadership in pacifist and humanitarian movements out of proportion to their influence in other political institutions of the time, and recent decades, in which women and their interests have a an unprecedented influence in all walks of life, are the decades in which wars between developed states became increasingly unthinkable. And while distractions like this can be a downside, more and more companies are choosing poolside venues for serious negotiations. For decades, blockbuster movies were green-lighted in the cabanas at the Beverly Hills Hotel. The Cosa Nostra managed its mob empires from oceanside lounge chairs in South Beach or over a mojito at the iconic Hotel Nacionalin pre-Castro Havana. Today, however, “I’m increasingly seeing small groups of people wanting to get together in unusual or nontraditional spaces,” says Betty Wilson, the vice president of divisional sales at Starwood Hotels. The demand for “sun and fun” settings has sold out the 20 thatch-roofed beachfront huts at the Marriott Beach Resort, and the two-story air-conditioned cabanas at Loews Miami Beach. In cooler cities, meetings take place on outdoor terraces in summer and in spas all winter. According to the Times, part of the appeal is simply that people actually like to go to meetings in such pleasant places. Part is the perpetual drive for the new and the novel. But more important is that professionals are now having smaller meetings, and they seek more collaboration. Paul Ekman and his colleagues wondered about the universality of facial expressions and went to their lab to find out. There they showed Japanese and American male subjects the same videos, one about a puppy and one documenting a circumcision rite in New Guinea where a stone was used as the “surgical instrument.” Ouch! The Americans expressed a combination of surprise, fear, and disgust on their faces. By comparison, the Japanese showed nothing. The immediate conclusion would be that facial expressions are not universal, but that would be wrong. Ekman wondered what would happen if the subjects viewed the videos alone, with no researchers in the room. The hidden cameras showed no differences—the universal response was surprise, fear, and disgust. The Japanese are socialized to control their expressions of emotion in social settings, and the Americans less so. In our own laboratory we videotaped Japanese and American businesspeople’s facial movements during simulated negotiations, and then we counted the expressions. We found no differences. Our interpretation is that the Japanese move their faces just as much as the Americans, but the Americans cannot read their Japanese counterparts’ facial expressions because of timing differences and other social factors. Thus the Americans report they see nothing except the Japanese poker face. The implications for negotiators are clear: Body language (or in poker parlance, “tells”) can provide useful information, but the chances of misinterpreting them, particularly in cross-cultural circumstances, are great.